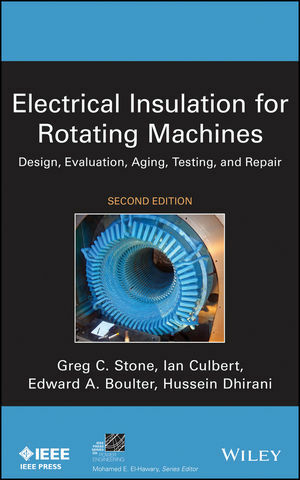 Electrical Insulation for Rotating Machines: Design, Evaluation, Aging, Testing, and Repair, Second Edition covers all aspects in the design, deterioration, testing, and repair of the electrical insulation used in motors and generators of all ratings greater than fractional horsepower size. It discusses both rotor and stator windings; gives a historical overview of machine insulation design; and describes the materials and manufacturing methods of the rotor and stator winding insulation systems in current use (while covering systems made over fifty years ago). It covers how to select the insulation systems for use in new machines, and explains over thirty different rotor and stator winding failure processes, including the methods to repair, or least slow down, each process. Finally, it reviews the theoretical basis, practical application, and interpretation of forty different tests and monitors that are used to assess winding insulation condition, thereby helping machine users avoid unnecessary machine failures and reduce maintenance costs. An ideal read for researchers, developers, and manufacturers of electrical insulating materials for machines, Electrical Insulation for Rotating Machines will also benefit designers of motors and generators who must select and apply electrical insulation in machines. GREG C. STONE, PhD, is an electrical engineer working at Iris Power L.P. in Toronto, Canada (a company he helped to form). Prior to that, he worked for the Research Division of Ontario Hydro, which at that time was the largest electric power utility in North America. IAN CULBERT currently works as a rotating machine engineer at Iris Power L.P. in Toronto, Canada. Prior to that, he was a specialist at Ontario Hydro (now Ontario Power Generation Inc.) where he provided technical support to power station project engineering, operations and maintenance staff on the design, specification, maintenance, and repair of all types of motors and standby generators. Prior to that, he was a motor designer. EDWARD A. BOULTER, Lt. Commander (Ret. ), USN Reserves, is now a consulting engineer. Previously he spent nearly forty years working as project/senior engineer and technical team leader designing machine insulation systems at General Electric. HUSSEIN DHIRANI was a senior generator design engineer at Ontario Power Generation.